Place tomatillos, celery, garlic and onion in a small pot; cover with chicken stock. Over medium heat, cook for 20 minutes or until soft; remove from stove and allow to cool. Transfer mixture to a blender and add cilantro, TABASCO® Green Sauce, salt and puree until smooth. Set aside. Season chicken breasts with salt and pepper. 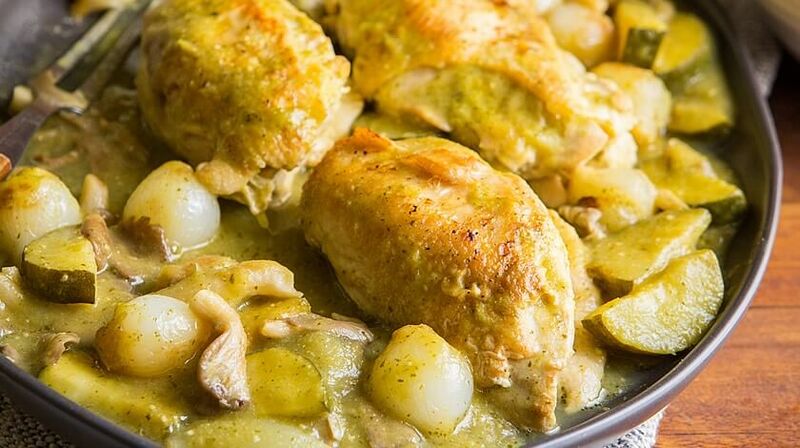 In large sauté pan, heat oil over medium heat and place pearl onions and chicken breasts skin side down, sautéing until both sides of chicken are golden brown. Remove chicken from pan and reserve (chicken will not be fully cooked). Add zucchini squash and mushrooms and sauté for 5 minutes. Add salsa verde to vegetable mixture and simmer for 5 minutes. Add the chicken breasts and simmer until the chicken is fully cooked, approximately 25-30 minutes. To serve, transfer the chicken and salsa verde mixture to a large platter and garnish with queso fresco and fresh cilantro leaves. Serve immediately. *Baby portabella mushrooms or white button mushrooms may be substituted for oyster mushrooms in this recipe.